Exclusive to AHRA members. 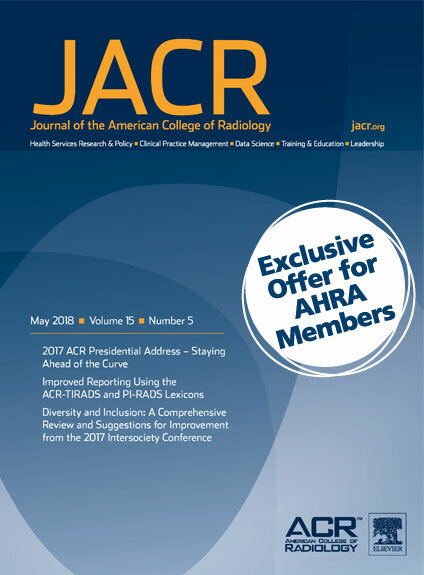 Learn more about how the practice and policies of radiology are changing with a subscription to JACR. For $45/year you can receive a print copy of JACR, the JACR app, and the full digital version including special online-only materials. (Or for $35/year enjoy the full digital version!) Save over $150! JACR meets the needs of all members of the radiology care team. For example, Radiologist Manpower Considerations and Imaging 3.0: Effort Planning for Value-Based Imaging identifies key potential changes in your staffing to achieve value-based care. JACR features Case Studies in Clinical Practice Management that translate policies and guidelines into actual practice. The JACR editors focus on practical take-home points that readers can apply in their care setting regardless of size or scope. JACR offers ways for radiologists and their business managers to collaborate and communicate to everyone’s benefit: practitioners, managers, and patients alike. *Subscription order must be placed online. "The JACR gives you a window into what your radiologists are thinking about. I believe that our success as directors will only occur if we partner with our physician leadership. Having the JACR available to me will enable this success."